Following their 5-1 thrashing by Canada’s Olympic team, Guyana Football Federation (GFF) President Wayne Forde is calling on the populace to be patient with the Golden Jaguars as they aim to develop against quality opposition. On May 15th at the National Stadium in Providence, the Golden jaguars lost to Canada’s U23 team in an exhibition encounter featuring several senior Golden Jaguars. Speaking at a press conference held at the entity’s headquarters, Forde said that while he understands the feelings of the fan base because of the nature of the defeat, patience is needed at this point and that we all should look at the bigger picture in the development of the team especially against superior opponents. 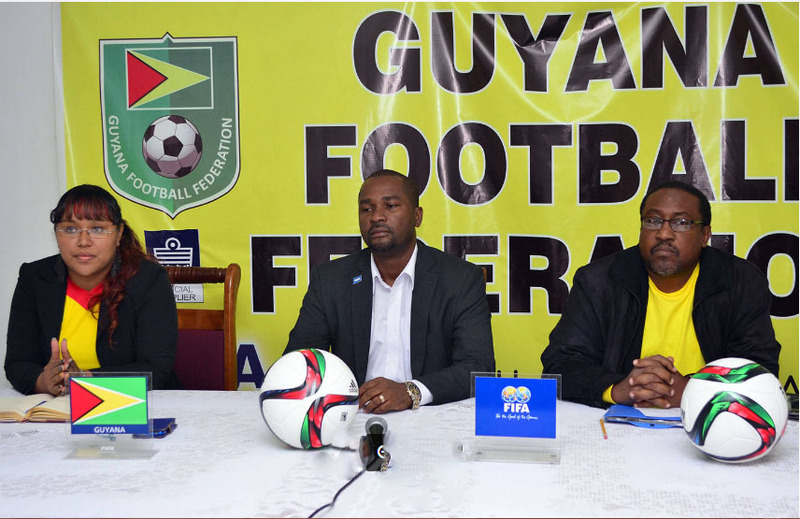 Guyana Football Federation President Wayne Forde (centre) addressing the gathering while Golden Jaguars Head-coach Jamaal Shabazz (right) and GFF Director of Communications Debra Francis looks on. 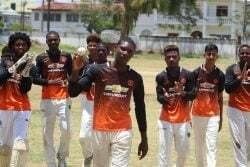 According to Forde, Guyana needs to continue playing the higher-ranked nations as it is the only way the quality of the team will rise. He declared that the federation was in communication with two other footballing heavyweights to face-off with the national setup. 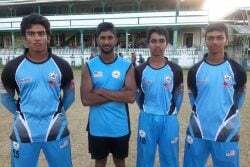 “It was important for Guyana to play Canada. As matter of fact, I’m actively in conversation with the United Kingdom team that we want to bring down here in July for a series of games. I’m actively pursuing the U.S. Olympic team. We have to put ourselves against these opponents”. The GFF chief declared for Guyana to be recognised as a serious contender amongst its Caribbean counterparts, matches against better opposition are required in a consistent basis,” said Forde. “It would have been an easier thing for Guyana to invite one of our opponents from the CFU family to play on the 15th May and beat them 3-0, 7-0 or whatever, but we used the opportunity first of all to give some of our young players an opportunity to play and get some time on the pitch, but also we wanted to put ourselves up against a formidable opponent. “That we did” he added. Forde thanked the team for the effort displayed against Canada noting that the fans should be analytical in their criticism because of the rebuilding currently being underway in the nation’s football landscape. Golden Jaguars Head-coach Jamaal Shabazz echoed the sentiments of the GFF boss, noting that while the fixture was used to expose several players, he will take responsibility for the defeat. Shabazz noted that the management team opted to expose players who were on the fringe of the national setup adding that the intention was never to disappoint the various stakeholders inclusive of the fans and corporate Guyana with such result “but this is sport”. He noted that the disappointment felt by the public highlights the impact sport has on everyone, declaring: “But how can we plant bitter cassava and expect to reap sweet potatoes. I take responsibility for the performance and the selection of giving this opportunity to the players”. Guyana will return to International action in the month of June for the second round of the CFU Caribbean Cup Qualifiers.